Quantitative areas of expertise include genomic clustering analysis, survival analysis, genomic data analysis for small sample size, exploratory data analysis, supervised principle component analysis, and sample size calculations. Manali Rupji, MS, is a Biostatistician and Bioinformatics Analyst in the Bioinformatics and Biostatistics Shared Resource at Winship Cancer Institute of Emory University since July 2015. 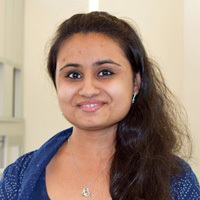 Ms. Rupji obtained her Master of Science in Biostatistics from Drexel University in Philadelphia, PA, and her Master of Science in Biology with a concentration in Molecular Genetics and Biochemistry from Georgia State University in Atlanta, Georgia. She completed her undergraduate work with a Bachelor of Engineering in Biotechnology from University of Mumbai, Thadomal Shahani Engineering College (TSEC) in Mumbai, India.